Generally speaking, Millennials are self-absorbed, wasteful, even greedy, and not terribly responsible, compassionate or willing to sacrifice. Or so people in that generation (ages 13 to 33) told the Pew Research Group in a 2015 study. 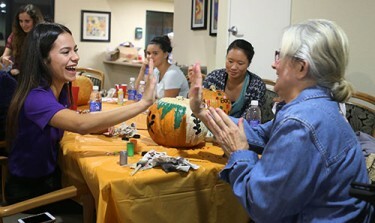 Colter Commons resident Judith Hall and GCU student Alexis Lopez share a moment over pumpkins earlier in the semester. The surveyors must have skipped over Grand Canyon University. Here, a growing number of students rise before the sun to feed the homeless, wedge into their schedules babysitting time for neighborhood moms learning English and consistently make friends with 6-year-olds and septuagenarians alike. The students do it for no pay or school credit. They get much more — the joy of being able to give back to the community. They are part of GCU’s mushrooming Local Outreach, which has twice as many student-led ministries this year as last that have attracted 1,500 volunteers in the first 10 weeks of fall semester. Chris Cunningham, Local Outreach coordinator, said the students’ commitment to and love for the populations they serve debunk stereotypes about Millennials. GCU student leader Aaron Koehne and Colter Commons resident Barb Cowan have become friends since GCU started the ministry at the assisted living complex east of campus in September. Playing bingo with elderly people and engaging them about the good old days probably isn’t in the top five activities of most college students. 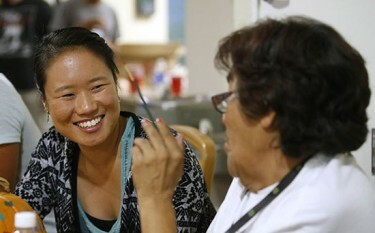 Those in the Colter Commons ministry, lovingly referred to by some as “Adopt-a-Grandma,” aren’t most students. Since September, about 20 students have been building relationships with senior citizens at Colter Commons, an apartment complex a block east of GCU’s campus. They walk over for a resident’s salsa lesson or to carve pumpkins and have hosted residents on campus to swim in the Papago pool, tour campus or dine and stroll together along Lopes Way. Until now, some Colter Commons residents lived there for years and walked around its expanding borders without ever stepping onto campus. For others, it had been months since they’d left their rooms for much of anything other than meals, but now they venture downstairs and eagerly wait for the college crowd from next door to arrive for games and prizes (including a crowd favorite, Windex). Junior Veronica Montgomery (left) enjoys the company of Colter Commons resident Lanaye Zummallen. Junior Veronica Montgomery, 20, was raised by her grandmother as her parents worked to support the family. Montgomery, whose grandmother died in 2014, has always enjoyed older people because of their stories and simple pleasures. The Colter Commons residents, including Lanaye Zummallen, with whom she has established a special bond, exude a positivity that the college students need. The happiness on the face of Cathleen Daly (left) speaks volumes about the relationship between GCU students and Colter Commons residents, including Martha Lopez. “They think we are doing something for them, but it’s definitely vice versa, and I think that’s across the board with the ministries GCU has,” said Montgomery, an elementary education/special education major. That same evening, Colter resident Barb Cowan played a game of pool with three students. They are “a blessing, a breath of fresh air” from a neighbor she has grown to admire. 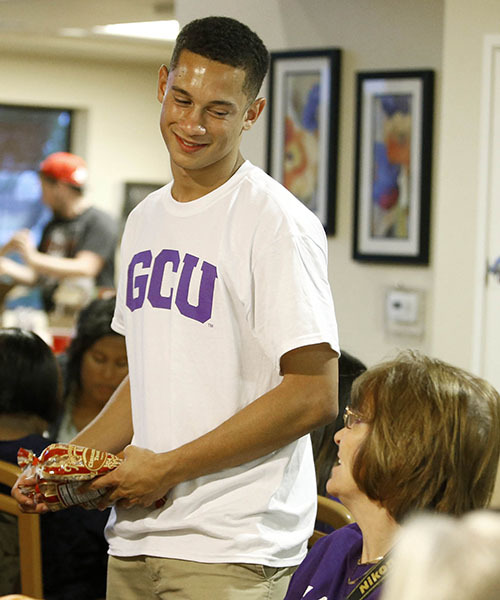 “GCU’s building around us is like a giant hug,” Cowan said. Isaiah Gomez is quick to get to the heart of his involvement in Neighborhood Ministries, which weekly brings GCU students to a warehouse of energy and harsh reality near downtown Phoenix. On a recent Monday evening, about 100 inner-city youth in kindergarten through seventh grade participated in Kids Life, a Neighborhood Ministries program that offers a structured evening of art, Bible stories and songs, small group discussions, outdoor play and dinner. Kendra Carter, a 21-year-old GCU business management student, tried to coax a bite of hot dog, just one, into little Manny at a table where they worked on a rainbow drawing. Kids Life director Bryan Larson said GCU students offer a steadying, consistent presence to the little ones and are role models for the older youth. Gomez, an entrepreneurship junior and the first person in his family to go to college, shines during a Bible study with the older boys. He leans in and looks them eye-to-eye when the topic of God’s existence arises. “I haven’t seen Him yet, but I see Him sometimes in creation,” Gomez said, the boys nodding in agreement. When GCU students walk over every day of the week to First Southern Baptist Church on the southeast corner of the main campus, they are ready and able to handle a variety of tasks at the New Life Pregnancy Center. It may be as simple as handing out diapers with a Bible verse printed on the package, sorting donated clothes or being responsible for collecting cards the mothers have posted on a prayer wall. It may be as challenging as babysitting a child whose mother is learning English or how to become a better parent. No matter the job, the new partnership is a blessing to the 25 GCU students who have volunteered this semester, said Jaci Curran, Local Outreach coordinator. “It helps them to step outside their normal comfort zone, to open their eyes to the rest of the community and to begin a lifelong practice of helping others,” Curran said. It hasn’t been so long since Mary Khorany was a tween, and she knows how impressionable and vulnerable an age that is, how she could have used a wiser but not so much older person in her life. The 20-year-old didn’t think twice about taking the lead in Youth Ministries this fall. She and other GCU students handed out fliers in October to parents at Canyon Kids, a Saturday morning Local Outreach ministry at which children are taught Bible stories at Little Canyon Park on the University’s northern border. They invited older children to come to the park late Monday afternoon to be picked up by GCU students and head to campus for bowling and pizza in Thunder Alley. Khorany planned for 15-20 pre-teens. Forty showed up. “I was blown away by how God worked,” the business management junior said. Each week, music, games and a Bible message are shared before the students break into small groups to talk about whatever is on their hearts. And, of course, there is food.